Nice house, with 3 bedrooms, kitchen and living room. Terrace on the front! Nice and nice house to spend time when you are not on excursions! Calm neighbors and the house is located on the plot at the far end of the street. Total renovated and new furniture for season 2018. Air conditioning and ceiling fans in the living room as well as in 2 bedrooms. Fitted kitchen with stove, large fridge / freezer, microwave, cooking utensils and crockery. Living room furnished with sofa and dining table with seating for 6 people. On the back there is a nice outside shower and 2 sun loungers. Lovely terrace on the front with outdoor furniture. Moped Available to rent directly by us. Mopeds are available for rent directly from us. Precis vad vi vill erbjuda gästen! Hoppas vi hörs igen. We were 4 persons in the house and used the two bedrooms with aircondition. This house had everything we needed!! The fridge was big and there were plenty of room for water, beer, eggs and fruit. We bought bread in the supermarked and put it in the small freezer on top of the fridge. Using the gas, we boiled eggs and used the toaster if we wanted our bread fresh. Thanks to the owner, Alexander, we were met by a taxi from Krit at the airport and driven directly to the house. We had contact with Krit the rest of our holiday. We paid 1.500 thb for the taxi from Phuket Airport to Khao Lak for two persons. The driver spoke very good English and we did not have to bargain or discuss the price. The internet in the house was working all the time and we phoned Krit from Messenger every day when we needed a tuk tuk to Memories Beach Bar or in the evening when we went out. When returning home, we took an ordinary tuk tuk from Khao Lak and asked them to drive us to Hotel Mohin Tara, which is a few minutes walk from the house, because all the taxi drivers are not familiar with the address. We will recommend Memories Beach Bar. The sun beds were free, the staff are smiling and helpful, they serve cold beer and good thai food, not to mention the beautiful beach. The tuk tuk from Krit was 300 thb from the house to the beach. Thank you for a very nice stay in your house and the good contact we had before and during our holiday! Thank you Vigdis for your review! I'm very glad to hear that everything was nice for your stay! För fjärde året har vi tillbringat jul och nyårshelgen hos denna hyresvärd. Första två gångerna i deras äldre/mindre hus och de senaste i detta nyrenoverade lite större hus. Vi har alltid blivit väl bemötta av hyresvärden och det allra mesta har fungerat kanonbra. Det lilla som fallerat har de åtgärdat så fort de kunnat utan diskussioner. Huset är jättefint med toppenkök, mysig veranda och det är rent och välskött. Ligger i ett mycket lugnt och tyst område med blandad befolkning varav drygt hälften är Thai. På gångavstånd hittar man en Morning Market där all tänkbar, och lite otänkbar, mat finns att tillgå. Färskare frukt och grönt finns nog inte. Det krävs transportmedel för att ta sig till alla fantastiska platser och det finns scootrar att hyra hos hyresvärden. Fler finns att hyra i närområdet om man behöver fler. Själva hyr vi bil direkt vid flygplatsen. Stränder finns det i överflöd och restauranger likaså. Alla kan hitta sina favoriter och några av våra är Pam’s Restaurant, Memories Beach Bar & Surf, Lucky Restaurant och förstås Bang Niang Market. Söker ni ett bekvämt, fräscht och tryggt boende under ert besök i Khao Lak vill jag varmt rekommendera detta hus och denna hyresvärd. Roligt och underbart med bra feedback! Vi gör vad vi kan för att behålla er;) Välkomna till nästa december. Das Haus ist neu renoviert, schön, mit einer top Küche , die komplett ausgestattet ist, Terrasse mit Gartenmöbel. Alle Fenster mit Moskitonetze, schöne Außendusche, Safe. Klimaanlage und WLAN funktioniert gut. Das Haus wurde uns bei der Ankunft in einem sehr sauberen Zustand übergeben. Das Haus ist in einer Siedlung mit Langzeittouristen und Einheimischen, Nähe Markt und 7/11. Vermieter sind sehr freundlich und zuverlässig. Wir haben uns im Haus sehr wohl gefühlt und können es nur weiterempfehlen. Vielen herzlichen Dank für dank für die tollen Kommentare. Ihr seit bei uns immer willkommen. Hoffentlich wird euch das Haus genau so gut wieder im April gefallen. Khao Lak and the house is located about 80 km from Phuket Airport and takes about 1.5 hours by car. 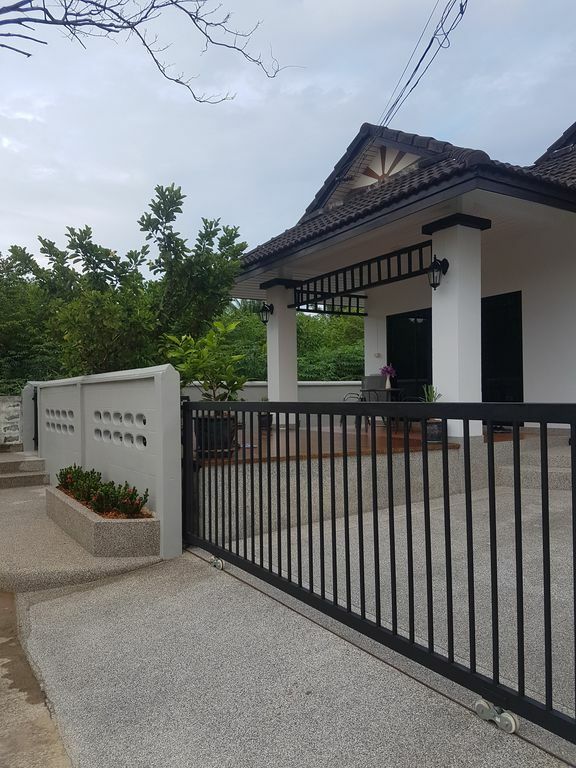 It is 3.5km to Khao Lak center, 2 minutes to 7-Eleven, 1.5km to Bang Niang and anywhere between 5-15 minutes depending on which beach you want to go to. White sand beach is a popular beach that should be experienced, but there are many more to discover such as Khukkak beach! Even the big food market every morning below the area is worth many visits, open early in the morning! The house is situated in a quiet area with both Thais and other nationalities, close to all the needs of the beach and shopping! If you choose to rent our scooter or someone else will take it easily everywhere in the neighborhood, and no problem to take a little longer day trips! There is also a wide selection of 'tuk tuk' taxis to use for a reasonable amount. Förbrukas mer än 1000 bath i el under en 2 veckors period debiteras hyresgäst i efterhand. Normalt sett klarar man sig under 1000 bath på 3 veckor, men det är om AC stängs av när man inte vistas i huset.